It's the time of the year. Follow this new year inspired ideas and showcase your jewelry displays. Christmas has now come to an end this year but just because the shopping frenzy is over doesn't mean you have to makeover your displays right away! Yes, it may be time to take down Santa and Frosty the snowman until next December but we can help you make the transition quick and easy with some simple alternations. Like many jewelry retailers, you might be feeling exhausted by the prospect of doing any more decorating before the end of the year. If you're running low on ideas don't freak out because we have some fun ideas to get you through the remainder of winter! Don't immediately toss your Christmas props and hard work! Reorganize the store fixtures in your space to make it different while keeping the same festive decorations. Let's not forget New Years! If you're feeling ambitious about changing out decorations after Christmas, take advantage of this week to go all-out with dazzling details. Start with white carpeting in your storefront window, then pick out display fixtures that add a pop of color and contrast acrylic displays and risers. Sparkling details like glittery decals, Swarovski crystals, and seed beads a dazzling touch of magical sparkle to your store. You can also keep the snowflakes and icicle lights from your Christmas display to make it a true winter wonderland look! For a chic new years display, we recommend putting all of your best statement pieces out front and center! Shoppers always want to be the center of attention on New Year's eve with glamorous pieces. Feature jewelry with diamonds, Swarovski crystals, Czech glass beads, and diamante accents! Also choose chic packaging such as white and blue tissue paper, navy blue paper jewelry boxes, and craft gift bags and boxes! We have an amazing selection of gift wrap and gift boxes to help make the entire experience from display to purchase a wonderful winter experience for your customers! Happy New Years from all of us at Nile Corp! Categories: after christmas, Display ideas, jewelry displays, Nile Corp. The holidays are the busiest time for a retailer, which is great for sales and can really end the fiscal year nicely for many businesses. It’s important to remember that a good holiday season can break sales records for the year before. Nile Corp. wants to let all its valued customers know that we want you all to have a very profitable holiday season and we’ve compiled from useful tips for many of our independent retailers, enjoy. 1. Clearly explain shipping cut off dates. If your business will be closed December 24 and 25th please make sure to put these restrictions on the checkout page and homepage of your website to ensure customers know that there will be a delay in ship out dates. 2. Study your years past sales record. The goal this year is always to do better than years past. Carefully analyze your last year’s sales and make attainable goals for your staff to schedule and make sure you have adequate amounts of needed supplies such as jewelry boxes, necklace display stands, and gift bags. 3. Offer post cut off date options. For those customers needing last minute gifts consider gift cards or instore gift certificates so people can shop after the shipping cut off period. 4. Just because many of your competitors shut down during this time of year, many customers attend networking events during the holidays. Try to reach out to them and make new connections via holiday parties and gatherings. We would like to wish our valued customers a happy holiday and a strong selling season this Christmas, from all your friends at Nile Corp! Create a Visually Appealing Multi-Strand Necklace Display! When it comes to jewelry business, we can’t emphasize enough the importance of incorporating the hottest jewelry trends in creating a stunning necklace display stand. From using the trendiest jewelry pieces to adopting various materials, you can surely create a jewelry display that can set you apart from other jewelry stores. One of this year’s hottest trends when it comes to jewelry fashion is wearing multiple necklaces to spice up a simple outfit. This fashion trend highlights the bold and exciting ways of mixing and matching different types of necklaces. For fashion forward ladies, multiple strands help create a fashion statement that easily draws the attention of everyone. Show off your styling expertise by creating a visually appealing multi strand necklace display! Just remember the rules of wearing multiple necklaces and apply it on your display. Want some tips on how to do it? One of the traditional rules in wearing jewelry is wearing a single type of metal throughout your outfit. Fortunately, we can now mix and match different gold necklaces to silver or even bronze necklaces. The warm and classic look of gold plays well with the cool and easy silver, creating a delicious flavor that is pleasing to the eye. Display your jewelry like the way you want to wear it – fun, fabulous and enchanting. Discover your own way of mixing the energetic colors of emerald, aquamarine, coral, or cayenne. This style will help create a lively vibe in your store and will draw the attention of the ladies towards your necklace display. Use different sizes of pearls, from small and meek to big and bold sizes, to add volume and style to your jewelry display. Suggest different ways to wear multi strand necklace through your display and encourage shoppers to try the same. You will be surprised about the way they come up with their own style using your jewelry. Trust them to spread the word about your store and watch them come back for more. Don’t just settle with the traditional way of displayingjewelry. The trends are changing and your customers will surely be looking for more. Keep them interested by incorporating different trends to your everyday necklace display. For small business owners and entrepreneurs, bringing your products to where the crowd is, is a great way to boost sales. Now that the Holidays is just few weeks away, people will be utilizing different ways to complete their shopping list. Explore new market, meet new people, learn new ways to showcase your acrylic necklace display and gain useful experiences by discovering different places to sell jewelry. Capitalize on seasonal opportunities to promote your jewelry business. Whether you’ve been in this industry for a long time, or a first timer in this business, you will surely enjoy exploring new venues to sell your jewelry. A lot of local businessmen and entrepreneurs join together to host annual craft fairs or flea markets where you can rent a booth for free or for a minimal fee. Just go to your local Chamber of Commerce or business organizations to know about the schedule and location of bazaars in your area. If you’re lucky, you may also be invited to other trade fairs in your city. If you have other entrepreneur friends who can sell your products on consignment basis, you can also take that as an opportunity to widen the reach of your brand. Create an impressive necklace display or customized ring showcase trays to make your products more engaging for the customers. Customers who are too busy to shop for the holidays love the convenience of shopping online. Make your products more visible to your customers this Holiday season by setting up your own website or signing up to different ecommerce sites where you can sell your jewelry for a minimum fee. Gather your friends for a jewelry themed party this holiday! Invite your friends who also love hand crafted jewelry and impress them with your personalized designs. Play some Christmas music and serve holiday dishes to make the party more fun and exciting. Take your jewelry to different trade fairs and events to gain more perspective about jewelry industry. Learn new things on how you can improve your craft and earring display holders and more knowledge on how to offer better customer service. 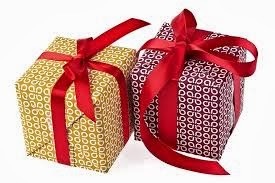 The holidays are the perfect occasion to give customers with a piece of eye-catching jewelry and matching packaging. Every product can be highlighted in your shop to stand out among seasonal merchandise during your high selling season. We've compiled two main points to consider to have your high selling season be maximized to the fullest! Enjoy! The first step for any retailer whose stock includes accessories is effectively advertising the stylish goods you have for sale inside your store. Gold and silver jewelry should be better accented on darker structures like black velvet square risers or necklace display stands. These classic pieces look both sleek and professional, and match with any retail tone. To flawlessly match the sophistication of your jewelry, you'll want pricing to be equally professional in appearance. Look for markers and backing cards with a bit of character, such as jewelry tags in a gold tone. 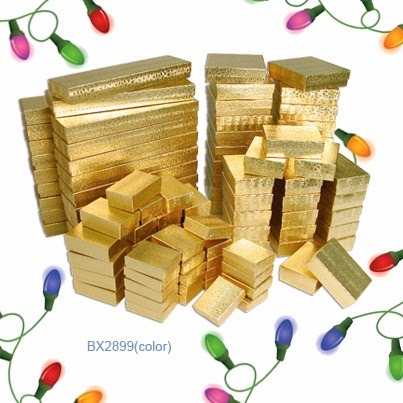 Proper jewelry supplies are a necessity year-round, but never more so than during the holiday season. For complete preparation, be sure to have a sufficient stock of packaging products on hand. Essentials for safe and stylish transfer include jewelry boxes and earring display holders. Velvet and organza pouches are a particularly classic piece, which come in a variety of fabrics and colors. Metallic hues and fun patterns like leopard print and floral designs. Jewelry gift boxes can be equally diverse and emphasize the point that good things really do come in small packages. With today’s tough business competition, it’s highly important for retailers to understand the art of persuasion and the factors that affect shopper’s behavior. Though there are a lot of factors that can influence consumers, their first impression are mostly driven by the colors they see in your store and in your brand in general. While color trends may change depending on the season, color psychology doesn’t. If you’re planning to redecorate your jewelry store or recreate your store’s necklace display stands, you should be aware that consumers regard the color you use as a significant factor in their decision to buy. A comprehensive infographic by Kissmetrics shows in great detail how colors can influence your consumer’s purchase. It shows how you can use colors to attract different types of buyers. Red, black and royal blue draws the attention of impulse buyers that it is appropriately used in clearance sale or when introducing a new line of jewelry in your store. Black is also used to market luxury products so if you’re selling expensive jewelry, you can use a black necklace display or black ring holders to highlight jewelry and accessories. Similarly, navy blue and teal draws the attention of budget shoppers and can be used if you are selling jewelry in bulk discounts. Blue is also known to increase the sensation of trust and security. 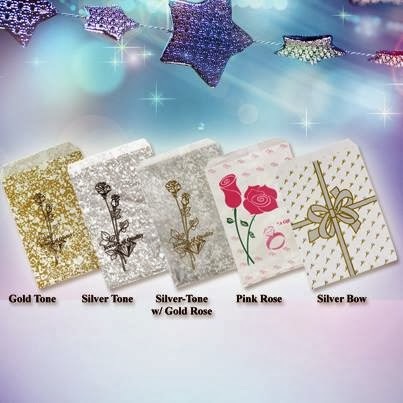 It can be used in decorating wholesale jewelry stores and large department stores. Clothing stores, fashion boutiques, jewelry stores and shoe outlets use pink, rose and light blue to market products to women and young girls. These colors often bring out the romantic side of the consumers and appeal to the emotions of the shoppers. It is common for people to associate the colors they see everyday to specific ideas, memories or feelings. This idea can also be used to enhance your jewelry display. Use different colors that are closely associated with the season like orange, red maple, and brown for fall; and blue and white for winter season. If you are selling environment friendly jewelry, use a necklace holder with a touch of green and yellow for a more natural effect. While it’s great to use different colors in your store earring display holders and jewelry stands, it’s also best to consider how it goes well with your brand. Consistency in the colors you use from your jewelry display, to your packaging and store interior can help in increasing brand recall. Season’s Greetings! It’s the time of the year once again when gift-hunting and gift-giving are up in the air! We all know that one of the most popular gifts for women during the holiday season is fashion accessories and jewelry. As store owners, how do you present your jewelry items in a way that can easily win the hearts of jewelry shoppers and uniquely capture the holiday spirit? Simple – with your store window display. A stunning jewelry display in your store can impress this season’s shoppers and set you apart from your competitors. Get rid of the cluttered, boring and poorly lit window display and invest your time and creativity to come up with a fabulous necklace display or ring display. This holiday, a lot of consumers will be on the look out for something that captures their attention. Having an impressive display is your key to winning everyone’s attention. Instead of just going for something ready made, try to conceptualize a way to tell a story through your store window display. Start with a theme and work your way to send out a message to costumers. Transform your store into a snow covered forest or use popular holiday symbols like stars and Christmas trees to create a sentimental look. Decorate it using statement rings or beaded necklaces along with other ornaments to make things more interesting. One thing amazing about the holiday season is how everything is covered in bright lights and glittery objects. Turn your usual necklace display into something dreamy and whimsical by using fluorescent spotlights or halogen spots to enhance the look of your display. You only have few seconds to capture the attention of the passersby and a good lighting is the key to get people step inside your store. A big part of your costumers will do their shopping early in the afternoon until late in the evening. A bright window display can effectively drive more foot traffic. A well lit window display will also help you stand out against your competitors and can highlight your fashion jewelry more effectively. 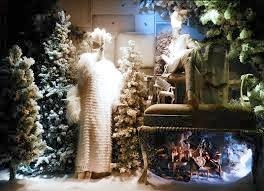 Whether it’s a big window or a small store front, there is no reason for you to feel limited about your window display. With a little creativity and ingenuity, you can come up with a way to display jewelry with the available space. Use jewelry boxes, racks, tables or cabinets or hang different lengths of necklaces for added appeal. NileCorp.com has a wide array of necklace display and other jewelry display cases that can help you come up with the most impressive display this season. Check out our website or follow us on Facebook for more useful tips! The holidays are finally here! We probably all have so much packaging to do for our inventory at the store. 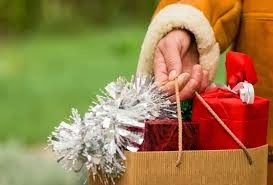 Whether your a shopper on the prowl for gifts of a retailer showcasing the best gifts you will need the best gift wrap and gift bags for the holiday frenzy. Here are a few simple ways to dress up window fronts to catch shoppers attentions during this hectic time of year, enjoy! Place gift wrapped boxes in the windows for an added holiday touch. Don't skimp on decor for your window displays this time of year. Create a winter necklace display stand that compliments store fixtures and jewelry displays nicely. Incorporate a mirror for a fun effect that reflects all the holiday sparkles. 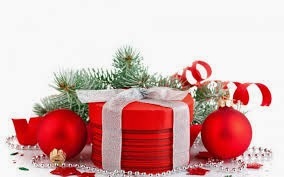 You can try to use a white holly wrapping paper as a background or red shiny wrapping paper for a festive look. Wrapping paper is a go to for holiday gifting, but it's not the only option for accentuating merchandise. You can also try festive gift boxes, bows, gift page, organza bags, and linen pouches. Add sparkling details to bags and displays with Swarovski rhinestones and decals. Remember at the end of it all, the holiday season will soon come to an end. Make the most of this festive time to encourage shoppers to get into the holiday spirit by decorating your store front with novelty decor and offering festive gift wrap and bags. Happy Holidays! Categories: bows, displays, gift bags, gift wrap, holiday displays, jewelry displays, jewelry looks, Nile Corp.